Matching Papua New Guinea, a genuine contender to take out this year’s tournament, against India, recovering from a 166 point loss, was always going to produce a certain result; it was just a question of the margin. The match played out as expected. PNG were quick, skilful and continually managed to get numbers to each contest. 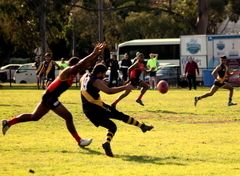 The PNG ruckman had the lion’s share of the tap outs, most of which landed cleanly in the hands of a teammate, who worked the ball easily into their Forward 50. For the first half PNG dominated and took a 123 point lead into the main break. Besides an inaccurate first quarter, PNG otherwise had a near flawless performance, with the ball never in their Defensive 50. Shrowder’s motivational speech, coupled with a key change of D’Moore to Full Back did have an effect. Whilst PNG was equally impressive in the second half, India managed an inside Forward 50 and held PNG to five fewer goals than their first two quarters. The final result was 216 points in PNG’s favour. Both teams next play matches on Saturday; PNG against South Africa in Geelong and India against Pakistan in Cragieburn.